WITH BACK TO school time approaching, a number of TDs are concerned about children losing their seat on the local school bus. A row has been brewing between the Minister of State for Training and Skills, John Halligan, Fianna Fáil’s Thomas Byrne and Independent TD Michael Fitzmaurice over the issue for a number of months now. Byrne and Fitzmaurice claim school bus places have been cut back right across the country, however, the minister said kids that are eligible for a seat on their local school bus are getting one. The School Transport Scheme transports children who live in remote areas of the country to and from their nearest school. In general, children are eligible for school transport if they are attending their nearest school and satisfy the requisite distance criteria, said the Department of Education and Skills. Children who are not eligible for school transport may still apply for transport on a concessionary basis. These are students who do not live far enough away from their local school to be directly eligible to avail of the scheme, but nevertheless may avail of school transport if there are spare seats on the bus. The annual cost is €300 per secondary school child. A commitment is contained in the programme for government to review the concessionary charges and rules of the School Transport Scheme prior to Budget 2017. Byrne said he is very concerned about the possible reduction of concessionary places. He claims it is the department’s aim to encourage the provider of the School Transport Scheme, Bus Éireann, to reduce the number of seats on buses used to transport students locally. He also claimed that smaller buses are being put into service, resulting in a decrease in the number of seats available. The Meath TD said Halligan broke his pledge that no concessionary school child will lose their seat due to the review being conducted. Halligan has denied this. Speaking to TheJournal.ie, Byrne said the minister told the Dáil there would be not cut to numbers and no downsizing of buses. However, he said in his area alone, one route has been downgraded to a mini-bus operation, which has resulted in 12 to 18 families left without a service. Byrne claims that a cross-party committee was to be set up in the summer months to deal with the issue before children started back to school. Fianna Fáil’s Bobby Aylward was nominated to sit on the committee, however, Byrne said he heard nothing more about it. Speaking to TheJournal.ie, Halligan said eligible children “are getting on the buses” and “all the difficulties appearing are around concessionary places”. On routes where there are less than 10 children, alternative transport is being offered, said Halligan. “I was only in this job a few months when this problem started to come in on top of me,” said the minister. Halligan said he undertook to conduct a review of concessionary places at the earliest opportunity, which is due to take place next week or the week after. The minister said he also wrote to all parties on 4 August about setting up the cross-party committee. However, Byrne said the review is just a cost-saving initiative and a “direct attack on rural Ireland”. During the government formation talks, the Independent Alliance talked “rural, rural, rural Ireland,” said Byrne, who said he was surprised at Halligan’s stance now that he is in government. This was a point reiterated by former Independent Alliance member Michael Fitzmaurice, who backed out of the government formation talks and left the party, due to his hard line on rural issues, such as bog cutting. 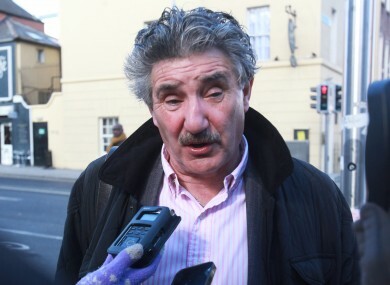 “I am shocked at John Halligan. He always stood up for the deprived people when he was in opposition,” said Fitzmaurice. There are problems with this issue throughout the country and if Minister Halligan cannot sort out the problem then he should not be in his position. It is my strong belief that no children should be left on the road. If the bus is not big enough to bring them then we will have to get bigger buses and more capacity. It makes no economic sense at all to be leaving children who are paying for their tickets on the side of the road. “If we take every single concessionary child that applies, it will cost an extraordinary amount of money,” said Halligan. “I am not in the position to allocate that money,” he said, adding that it would be the Department of Education that would have to find the funding. He said he found it “rather rich” of Fianna Fáil to be criticising his position, claiming that when the party were in government, it increased the fees for the service which impacted on thousands of families. “John Halligan has been well able to comment on a wide range of issues that weren’t in his department, and he’s entitled to do that, but he had a job to do to sort this out over the summer and he hasn’t done it,” said Byrne. Halligan said that pending the review, there has been no planned programme downsizing school buses for the coming school year. “There will, however, be route changes and variations in line with normal operational decisions that occur from year to year, and any impacts in terms of increases or decreases of available places will be marginal, in line with what occurs every year,” he said. Email “'No child should be left on the side of the road': Rural TDs row over school buses”. Feedback on “'No child should be left on the side of the road': Rural TDs row over school buses”.